Loom is made possible by great generosity. Thanks to all the sponsors listed below, Loom is growing in leaps and bounds. Please click the “Donate Button” to support our international programming. NOTE: You don’t need to be a PayPal member to donate, just click “continue” right above the credit card logos on the bottom of the Donate Button page. and a special thanks to Anne Marie Santoro and Barbi Miletich for giving their time along with their money, as Associate Producers at our Album Release Concerts last year. For 2012 Loom has more than 160 donors to thank. World In One Pan Arts Collaborative acts as Loom’s fiscal sponsor. Every other organizational relationship, every individual donation is generously coordinated and made possible by the World In One umbrella, along with instrument rental, PR support, and more. The Jam Jar Dubai has partnered with Loom to build audience and community outreach for contemporary performance in Dubai, collaborating to present workshops, work-in-progress showings, and support the ongoing development of Loom’s Dubai performances. 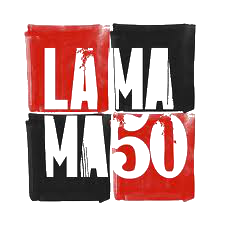 La MaMa Experimental Theater Company produced Loom Ensemble’s “Erosion: a Fable” as a part of their 50th anniversary season, with generous support, adding Loom to the La MaMa family of artists. North Manhattan Arts Alliance helped launch Loom with the seed grant that make all this possible.